Prayer is an important part of the religious life. Remote tribes present offerings and then pray for every day things such as health, food, rain, children and victory in battles. Moslems pray 5 times a day. Martin Luther devoted two to three hours daily in prayer. An order of nuns known as ‘The Sleepless Ones’ pray in shifts every hour of the day and night. George Muller established orphanages in England and by 1870 had more than 2,000 children under his care and 23,000 children had already passed through his homes. He never asked anyone for financial assistance or went into debt even though building the homes for orphans was extremely expensive. Every day he spent several hours in prayer imploring God for the practical needs of his orphanages. Many times, he received unsolicited food donations only hours before they were needed to feed the children, further strengthening his faith in God. There are many great pray-ers in history but I wonder how many of us can claim to be among them. Maybe we are a bit more like the people Philip Yancey interviewed. This is what he found as he asked, “Is prayer important to you? Oh, yes. How often do you pray? Every day. Approximately how long? Five minutes – well, maybe seven. Do you find prayer satisfying? Not really. Do you sense the presence of God when you pray? Occasionally, not often“. Many of those he talked to experienced prayer more as a burden than as a pleasure. They regarded it as important and felt guilty about their failure to pray. Prayer along with reading our Bibles has become a victim of our modern busy every day lives. We have the constant problem of not enough. and certainly not enough time to pray. If we want to bare our souls and find solutions to our problems there are therapists, counsellors and support groups. Who needs prayer? Communication with other people has become shorter as we send text messages, emails, instant messaging, blogs and this kind of communication is being transferred to the way we communicate with God. Prayer has become like sending God a text message. Short, instant, not much thought, not much time or effort involved. There is a place for text message type prayers but it becomes a sad state of affairs if that is the only we communicate. Prayer has been described and defined in many ways. Philip Yancey talks about prayer in a general way, “We pray because we want to thank someone or something for the beauties and glories of life, and also because we feel small and helpless and sometimes afraid. We pray for forgiveness, for strength, for contact with the One who is, for assurance that we are not alone”. (Philip Yancey, Prayer – does it make any difference? 2006 Hodder & Stoughton pg 5). Henri Nouwen says, “To pray is to walk in the full light of God, and to say simply, without holding back, “I am human and you are God”. Prayer is a declaration of our dependence upon God. O Hallesby states, “Our prayers are always a result of Jesus knocking on the doors of our hearts”. “It is by prayer that we couple the powers of heaven to our helplessness, the powers which can turn water into wine and remove mountains in our own lives and the lives of others”. Hallesby has so many wonderful descriptions about prayer. One more quote. “Prayer is given and ordained for the purpose of glorifying God. … If we will make use of prayer, not to wrest (force) from God advantages for ourselves or our dear ones, or to escape from tribulations and difficulties, but to call down upon ourselves and others those things which will glorify the name of God, then we shall see the strongest and boldest promises of the Bible about prayer fulfilled also in our weak, little prayer life. Then we shall see such answers to prayer as we had never thought were possible” (Prayer, 1994 Ausgburg Fortress pp 5, 26, 82 & 130). To pray is to let Jesus into our need and leave it to him what will best glorify his name. At the time when the South African government was brutally enforcing apartheid, Archbishop Desmond Tutu addressed a gathering at a university. The crowd of students were clearly enraged about the violence in South Africa and asked what they could do to force change. The archbishop replied, “I’m going to tell you all what you most need to hear, the single most important thing you can do for South Africa.” The building fell silent. “Pray,” he said softly. “Pray for my people. Pray for us and with us, daily. Pray. That’s what you can do. That will change the world.” Desmond Tutu was saying that violence, revenge and hatred do not bring glory to God. Pray for the solution that will. Not quite what the crowd expected but it was clear that the archbishop believed that prayer was the answer to the helpless situation in his country. This is taking God at his word, “Call to me when trouble comes; I will save you, and you will praise me” (Psalm 50:15). It is taking Jesus’ invitation seriously, “Everyone who asks will receive, and he seeks will find, and the door will be opened to him who knocks” (Matthew 7:8). Tutu believed that “the prayer of a righteous person (a person who is reconciled to God through Jesus) is powerful and effective”. William Barclay tells this story. In the days when the work of a domestic servant lasted all day and half the night, a servant girl said, “I haven’t much time to do things, but at night when I go to bed, I take the morning newspaper with me. I read the birth notices, and I pray for the little babies who have just come into the world. I read the marriage notices, and I pray that God will give these people happiness. I read the death notices, and I pray that God will comfort those who are sad.” Barclay continues, “No one in this world will ever know what blessing to unknown people came from an attic bedroom from one who prayed.” This young woman spent her precious spare time interceding for the needs of others, for strangers. She knew their names but not their faces, but that didn’t stop her bringing their needs before the throne of God in prayer. As James states, “The prayer of a righteous person is powerful and effective”. In 1540 Luther’s good friend, Frederick Myconius, fell ill and was close to death. When Luther heard of his illness, he immediately wrote a letter saying, “I command you in the name of God to live because I still have need of you in the work of reforming the church. … The Lord will never let me hear that you are dead, but will permit you to survive me. For this I am praying because I only seek to glorify God.” Myconius had already lost his ability to speak by the time Luther’s letter arrived. In a short time he was well again and died 6 years later – two months after Luther. “The prayer of a righteous person is powerful and effective”. When the forces against us are greater than we can endure or possibly hope to deal with and when our own resources whether physical or emotional or spiritual are at a low point, how can we hope to rise above everything that rages against us? We might try but we can’t. It all seems too hard and hopeless. And as we wallow in despair and frustration Jesus is inviting us, calling us, commanding us to ask and seek and knock in prayer. He is ready to use his power on our problems. He urges, “Call to me when trouble comes; I will save you, and you will praise me”. But why is it that we find it so hard to pray? Why do we neglect this rich source of strength and power for our daily lives? I probably don’t need to tell you the reasons why because we are all guilty. I guess at the bottom of it all is that it takes effort to pray. It takes effort to make time available every day to pray. It takes effort to be quiet and still for just a short while. It takes an effort to stop during a busy day and to spend time talking with God. It takes an effort at the end of a long day to stay awake long enough to pray. We readily and easily pray when there is a pressing need, when sickness or despair strike, but for the rest of the time prayer is often seen as a burden, as an effort, though it takes far less effort to pray than taking the wheelie bin out to the curb. We may doubt the value of prayer; we may lack the confidence that it really does anything. In fact, if we truly believed in the power of prayer we wouldn’t have any problems spending time with our heavenly Father in prayer. Prayer requires practice and perseverance if it is to become a gift from God that is well used. Prayer is not a quick fix to everything that upsets us. Maybe God’s answer is quite different to what we expected. But whatever the answer we know that it is an answer that comes from the perfect love of God and that our prayer then ought to be asking for a willingness to accept the answer God gives. Remember Paul prayed again and again for healing but God’s answer wasn’t the healing that he expected. God’s answer drew Paul into a deeper and closer understanding and trust in God’s grace to help him through the most difficult times – a lesson that would stick with him as he sat in gaol or was taking a beating. The answer was different to what he was praying not because Paul lacked sufficient faith, or that what he was asking was unreasonable, or that God wasn’t interested. God’s answer assured Paul that he was loved and cared for in a most wonderful way every day as he struggled with his debilitating illness. Sometimes when we are at our lowest words are difficult. Prayer then becomes relaxing and sitting quietly in his presence. Focus on a verse from the Bible that reminds you that the Lord is able to take care of you in even the most extreme circumstances. Let God speak to you rather you do all the talking. Prayer and meditation go hand in hand. How can we know what God wants for us if we never listen and are always talking? If you aren’t able to pray, ask for the Holy Spirit to help you in your prayers and to assure you that God has not deserted you and his love for you is even stronger in your time of need even though you might not necessarily feel it at that moment. Our loving Father and Saviour assure us that prayer is never wasted energy. We are certain “The prayer of a righteous person is powerful and effective”. When you or I leave for a journey, the first few days are always the best, aren’t they. The excitement of seeing and experiencing new things, meeting new people and the anticipation of reaching our destination, keeps us focused on the road; the journey. All of us travel on a journey at some point in our lives. In today’s gospel, Mark records how Jesus and his disciples were on a journey. They had been travelling around Caesarea Phillippi and had just arrived in Capernaum. Jesus and the disciples often journeyed together. Walking the dusty roads from one town to the next, preaching the kingdom of God, and teaching those they met about repentance and faith in the Messiah. In fact, God’s ministry and the mission of God’s kingdom, is by nature travel, is by definition a journey; a journey to go and announce the good news. To ‘announce good news’ in the original Greek is the word ‘angello’, from which we get angel…the angels were sent on a journey from heaven to earth to announce the good news concerning the birth of Jesus ‘Do not be afraid. I bring you good news of great joy that will be for all the people. Today in the town of David a Savior has been born to you; he is Christ the Lord.’ In keeping with this word, ‘angel’, to go and spread the good news of Jesus, we get ‘evangelise’ and those on the journey with the good news of Jesus are ‘evangelists’. The disciples were evangelists on a journey with Jesus…who was and is still today, the content and embodiment of the good news. Yet, have you noticed that while journeying, before reaching our destination, about in the middle, the excitement diminishes with the stresses and tiredness that comes with travel, and arguments start? 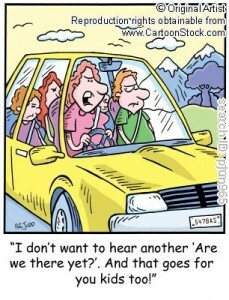 The kids in the back of the car ‘are we there yet!’, or to give a good example, a caravan park manager once told me that he could always tell when a newly retired couple were halfway through their first trip together. When arriving at the park, both the husband and wife would jump out of the car, red faced and not talking. The husband would have white knuckles from tightly hanging onto the steering wheel, and the wife would refuse to even book the van in; both knowing they still had many for miles to journey together. Somewhere along the journey between Caesarea and Capernaum, somewhere between the call to follow Jesus and the desire to fulfill the call, the disciples argued. Perhaps it was the heat of the journey, the difficult walk, exhaustion or perhaps the length of the journey, whatever the cause, the result was arguing among them selves. Mark writes, ‘They kept quiet because on the way they had argued about who was the greatest.’ The evangelicals no longer journeyed as ‘evangelists’ of good news, announcing the kingdom of God everywhere they went. Rather, they proclaimed the importance of themselves. They were no longer ‘evangelists’, in the true sense of the word, but had become announcers of ‘idolatry’, believing themselves to be more important than the message they proclaimed. Somewhere on their journey between Caesarea Phillippi and Capernaum, the disciples lost sight of Jesus and got caught up in an argument, boasting about being the greatest. Sound familiar? Sounds like something we do? Good Christian ‘evangelists’ on Sunday, but as our week goes on, as our daily journey continues, we, like the disciples, change from evangelists into idolaters. Perhaps in your weekly journey you are confronted by a situation that requires a choice between your best interests or the interests of another person, even someone we don’t like; what would you do, demand to be the greatest? Or there is an opportunity to show yourself to hold the high moral ground, showing up someone who has failed; would you be an evangelist or idolater? Would you be one to confess yourself to be a sinner before God on Sunday, then, during the week claim to be sinless and demand everyone else live a faultless life; would you act as a servant in compassion or as a ruler who is the greatest? This is why we come to church. Not because we want to show that we are greatest Christians, but precisely because we are not the greatest. We come because Jesus is here to serve us and bring us the evangelical message ‘it is by grace you have been saved, through faith– and this not from yourselves, it is the gift of God–not by works, so that no one can boast.’ This is why we should still call our worship ‘the divine service’, because this is in keeping with Jesus’ mission to serve us. Our journey in life began at the cross of Jesus. In baptism, we are born again into a life of servant hood, not glory, just as Christ served us. We are served by God each Sunday and in turn we go out as evangelists in our weekly journey, not to argue over who is the greatest, but to serve each other. You think about the great area of space and volume of air in this room, yet one small spray of this perfume and in a very short space of time, everyone here can now smell the aroma. There must be one part of perfume to a million parts of air, but very quickly the aroma is smelt by everyone; it has spread throughout the room. Such is the power of Perfume. Unless we do an experiment like we just have, we don’t quite realize how powerfully our words spread and change the air like an aroma. They come from our mouth and once in the air, our words spread throughout a group of people like an aroma in the air. Our comment goes from one ear to the next. Soon, everyone in our home, place of work or school knows what we said, and even some we didn’t want to hear have heard. I had no control over the perfume once I sprayed it. The aroma spreads with its own power. In the same way, we have no control over our words once said. We have no control over how far they spread, who will hear them, and how strongly people will react to the words. Words, once said, change the atmosphere, the feeling, the air within a group. With power like this at our finger tips, or should I say, on the tip our tongue, we have learnt to use our tongue to control and manipulate other people to get what we want. Right from a very young age, we have used our tongues to make noises and bring attention to ourselves; an aroma of screaming and crying fills the air and before long, mum or dad come and satisfy our needs. As you and I grow into adults we still use the power of our tongues to get what we want. We learn to become crafty and manipulative in the way we use our words, deliberately knowing they will spread the aroma of what we want for ourselves to those around us. Now days, we have become even craftier with our tongues, we speak through our fingers. What was once said is now emailed or texted, which has even more power to spread because there is no stopping a word once said on the internet, or a word on a text that is forwarded on from phone to phone. We must as parents warn our children about using the internet chat rooms and texting as a legitimate forum for personal conversation. Electronic words are never personal! By voice or by electronics, we are constantly adapting our words, finding new ways to say things to get what we want. James warns ‘[our tongue] is a restless evil, full of deadly poison.’ One smell of the deadly aroma of poison and you will die, in the same way, when people hear a word laced with poison, they die emotionally. One manipulative word, which demands a response from someone against their will, takes away a person’s right of choice and freedom to express their thoughts. If we manipulate someone with our words, to try get them to do something for us against their will, we take their life from them. We poison the life out of them with our words. God used the power of his word to put to death sin…our sins of the tongue. On the cross, which Peter rebuked Jesus for, he crucified in Jesus, our poisonous words; he put an end to us having to manipulate people to feel worthy and valued. On the cross Jesus died to redeem us from the deadly aroma of our self-righteous words that put down and control. This is why Jesus rebuked Peter, he knew he had to put to death our sinful way of life. Where there is death there is no more, it is an end; an end to poisonous words…but it is also the beginning of something new! These life-power words of Jesus have already acted upon you and me. We lost our life, died to sin in our baptism. But just as Christ rose from the dead, we too now live forever through our baptism, as Paul says in Romans 6 ‘we were therefore buried with him through baptism into death in order that, just as Christ was raised from the dead through the glory of the Father, we too may live a new life.’ And today you are redeemed anew from the poison that brings death that still flows from our tongue and from the tongues of others, when you eat and drink of Jesus body and blood in Holy Communion; for he is truly present for YOU, to bring you back to life again, as Luther constantly emphasized. Let us with our tongues, as James encourages, praise our Lord and Father. Allow the aroma of Christ to fill your hearts, your homes, your relationships and the words that flow from your tongue. Then, as we read and speak, live and breathe his word, by the power of his Spirit we will be renewed day by day into the likeness of Christ. For this Word brings the aroma life, and Christ himself.